A book on business management that I once read in order to see whether there were any insights that could help in pastoral work, rewarded me with one observation, namely that rumours can sometimes have positive effects. If a company allows a rumour to go round that there are redundancies in the offing, people who are subsequently made redundant will be prepared to some degree, and those who keep their jobs will be relieved. This is a brutal example but it has some relevance for the Catholic blogosphere. There is a rumour (and I understand from various sources that it is not a wild one) that Archbishop Piero Marini may be appointed as the Prefect of the Congregation for Divine Worship. 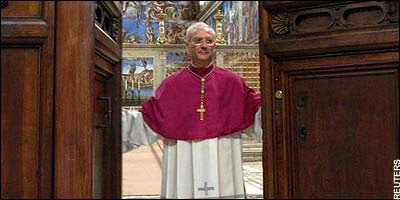 Archbishop Marini (not to be confused with the papal MC Mgr Guido Marini) was removed as papal MC by Pope Benedict. He is a disciple of the late Archbishop Bugnini and published a book "A Challenging Reform. Realizing the Vision of the Liturgical Renewal" which I wrote about briefly in 2007. If Archbishop Marini is appointed Prefect of the CDW, it will be a blow not only to traditionalists but also to the neo-orthodox supporters of the "reform of the reform." So it would be good to prepare ourselves for such an eventuality. Every day, as part of my morning prayers, I say the prayer Ecclesiae for the protection of the Church, along with the prayer for the Pope, both from the traditional Missal. I have done so ever since the foot-washing incident and do so each day as the bad news piles up. Following St Vincent Ferrer, I would urge that if you disagree with the Pope, prayer is not simply a piously sentimental comfort, but the proper course of action since it is an appeal to his immediate superior.